My Number One NYFW Accessory! I'm in the midst of NYFW and one of my favorite things to do, aside from experiencing all the collections from the fantastic designers, is getting dressed for the shows. NYFW, especially in September, is like the Superbowl of the fashion world! I prep my looks a few weeks in advance, from top to bottom and all the way down to the accessories. I like to experiment with a few different looks but still keeping true to my style. Accessories are always a must and my number one accessory I can't live without for NYFW is sunglasses. I feel they can elevate the simplest look. For this NYFW season, I partnered up with AC Lens to share with you guys a styled look I put together for one of the shows with these amazing sunglasses I selected. If you haven't heard about AC Lens, they are one of the largest online full-service eyewear companies. They carry eyeglasses, sunglasses, and contacts. They are a one stop shop for me since I wear all three! Hello, astigmatism, right? I'm head over heels in love with their sunglasses selection. They vary from so many frame styles and shapes and even carry top brands. The ones I'm wearing are the "Sophie" by Kendall + Kylie in a rose gold finish. The minute I saw these I knew they were perfect for NYFW. The shape and the color drew my attention: you guys all know I'm such an aviator style type of girl. When putting the look together with these sunnies, I really wanted something chic. I went with an all black jumpsuit with a ruffled sleeve off the shoulder top. I'm all about statement sleeves! The sunglasses added the the pop I was looking for. What are some of your favorite accessories you can't live without? Is it sunglasses like me? Hope you're keeping up with all my NYFW madness on social media and hope you been liking my looks as much as I am. Thank you to AC Lens for adding a touch a chic to one of my NYFW looks! This post is sponsored by AC Lens, as always all opinions are my own. Thank you for supporting the brands that work with Patty's Kloset. girl those glasses are fire! These sunglasses are too cool! The shape is so unique and love the pop of subtle color! Love love love those glasses! They're gorgeous. I love the hint of color to the lenses. So chic! Super cute shoes too. Thank you! They are the perfect touch of chic to my looks! I'm a big fan of the jumpsuit/overall trend rn! This entire look is amazing!! I am LOVING those shades!! SO fun! That sunglasses are the bomb! it is really a good choice, it makes your outfit more stunning. Enjoy with the Fashion week. Sunglasses are always my number one accessory. I have two drawers filled with them because I love them so much haha. This pair is killer on you, and I love the rest of your outfit too! The layering is perfect! Thank you babe! I'm sunglass obsessed just like you LOL! Looking great in those sunnies! The color is lovely on you! I love the shape of these sunnies! Stunning! 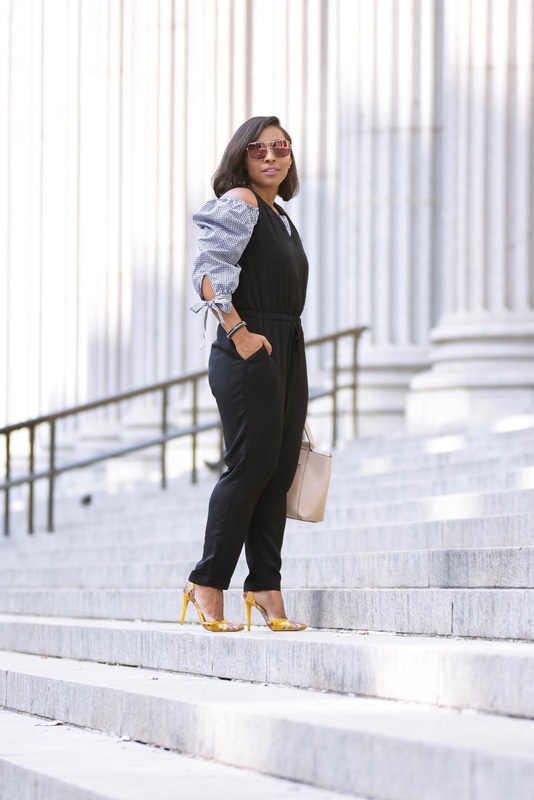 Love your jumpsuit! Those glasses are everything! 100% obsessed!